We can argue about the delineation between types of virtual world, games and social media and their popularity with users, press, business etc. However it does seem there are some interesting developments that feel like a rejuvinating step. For those of us in the industry and still passionate about it it is good news as we can help all the people just discovering all the wonderful benefits, the interesting challenges and sparking new ideas on how to communicate live online. 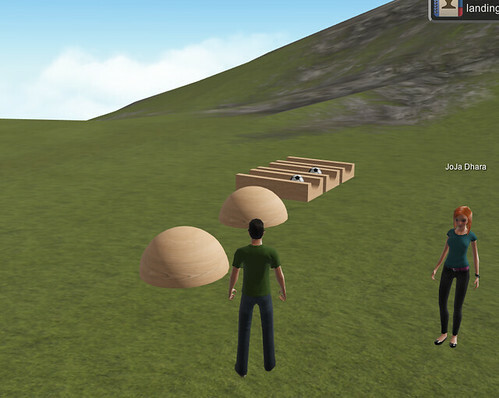 The first biggie is the birth of the web based (Facebook) virtual world. Cloud Party. 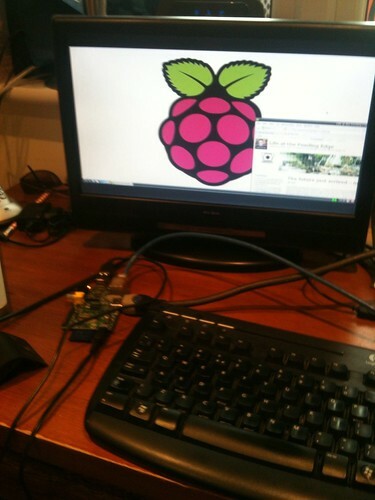 In the very early few weeks of this I could not easily get in on my Mac, teething troubles with sockets etc. So I left it to settle a little. Now I have at least visited. I popped into the environment, did a little bit of customisation on my avatar(no green hair by default 🙁 ) and had a chat with a fellow Metaverse Evangelist Joja Dhara, so it was like old times just in a new place. With in seconds I was trying building from the mesh palette. In other news we saw announcements about Google having another go a co-creation and virtual world spaces.Combining with Lego to create BuildWithChrome which is starting to look interesting after the demise of Lego Universe Online. Also the the former Nortel Web.alive, now AvayaLive is finally working not Macs too. It is less live user generated content but it does let user move around and talk with the VOIP working very well and is one to watch for what is a yet untapped corporate market for online communication that is richer than those telecons and powerpoints. It seems Redbull manage to spot and engage with movements pretty quickly. They obviously sponsor a lot of mainstream sport, and also lots of the cooler extreme sports but they are also promoting maker culture, even themeing an Arduino called the Bullduino which forms the basis of the competition to make something interesting. 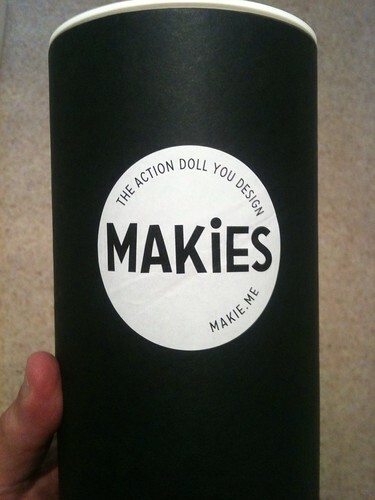 This is a drinks company engaging in the future and on the cutting edge of what is happening in society. 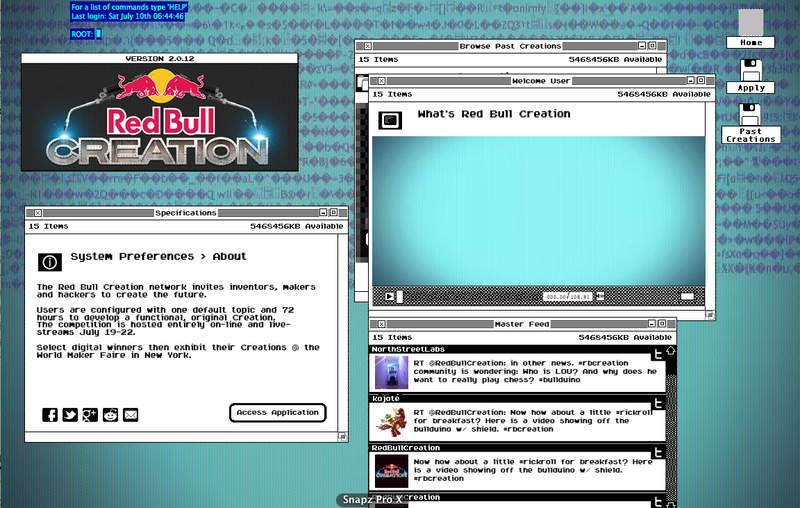 The competition running out of the US is called RedBull Creation and even its home page has an interest twist with an very homebrew look to the windows it shows. I think this points out that a lot more people are taking notice of maker culture in ways that are much more mainstream than anyone would have thought. It is a wave and one that collects up all the interesting technologies and social changes. Hardware and software creation and engineering, gaming, virtual world and 3d design and of course rapid fabrication with 3d printers. 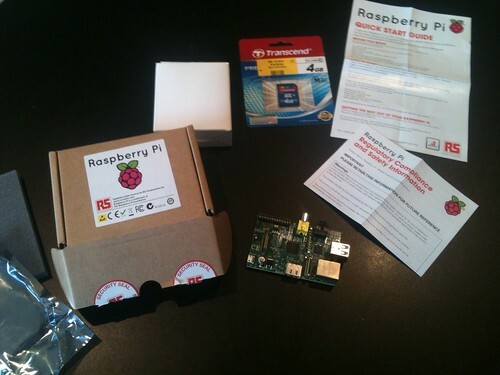 It is maker culture that needs to be nurtured in schools now that ICT has been scrapped. This is because it encourages the STEM subjects and the new engineers but also blends that with other creative forces and ideas. Rather than split things into one subject or another, one hobby or another the generalist concept of Maker culture fits much better. It is filled with a can do, can hack attitude that is going to be really refreshing to see it develop. 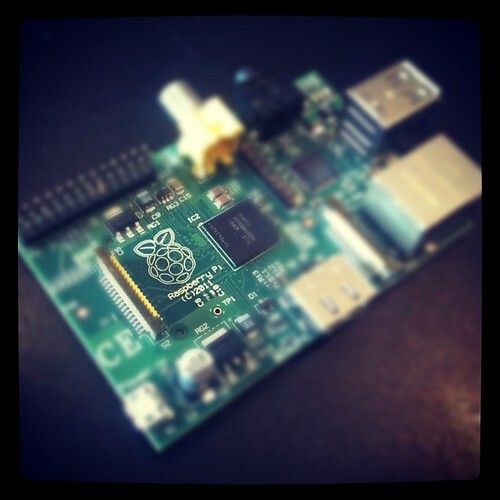 This has been a good week , first my Makie arrived, and now the Raspbery Pi has arrived on my doorstep. I was a little behind ordering it so ended up in one of the later waves. It is odd seeing it in the flash as I originally wanted to feature it nice and early on The Cool Stuff Collective as it is an important development. That didn’t workout. Still here is it now. I suffered a few technical hitches though. 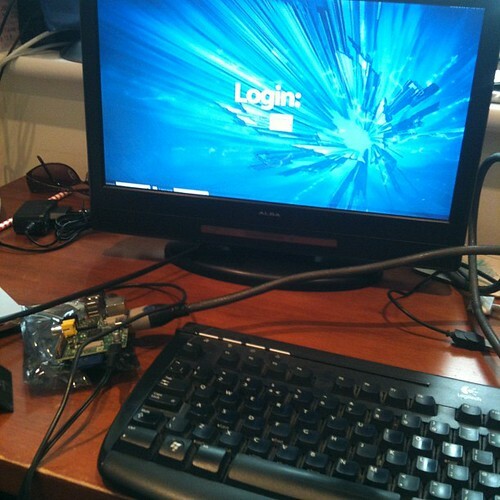 Firstly I couldn’t find any USB keyboards, nor adapters for a PS/2 keyboard to USB. Then I thought I would risk my desktop wireless logitech, though I figured that would be a non starter it was worth a go. Secondly my card reader was not happy with the 4gb flash card, so I ended up using my wifes newer MBP as its built in one worked fine. (You have a flash card to put the Operating System on). Having sorted that I took the power supply out of the box to find it was a euro plug not a 3 pin UK one. The one travel adapter that works backwards, didn’t. Again I was saved by my wife’s Blackberry charger with mini USB. After a bit of messing with the config.txt to fit the cheap HDMI TV I was plugging into I was all set to get going, but it refused to accept any of the passwords I had set. A quick google I found that i was working on some out of date info and that the Debian instance of linux was the one to use. The joy of open source is choice, but it is also its curse. A few minutes later, a new image on the card and away we went. At the time out house was full of kids on holiday running around and screaming, so I did not do anything “serious” but I had to try the Commodore 64 emulation to bring things full circle. Next up is finish the 3d printer (reprap) and print a case for the RPi, and see what makes sense to let the predlets loose on. 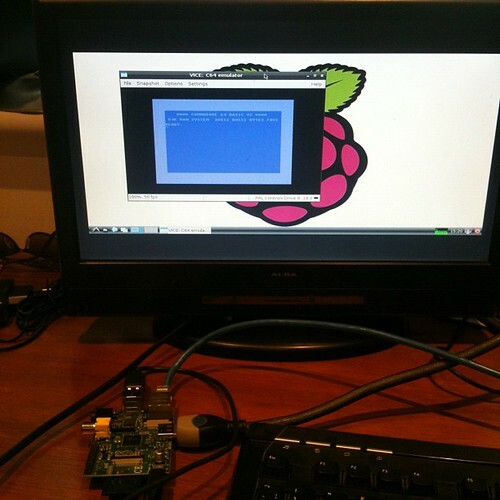 At the moment it is an operating system tinkerers paradise, just instal x with y and of course don’t forget z. Still it all has to start somewhere. A suitable kid friendly instance that doesn’t need lots of arcane command lines known only the linux gurus or that need another machine to constantly Google for best practice will no doubt appear. Being an early adopter and exploring both what technology does and what it actually feels like it is important to be in these first waves. In 2000 I emailed and ordered a small 3d printed tub from a multi-million pound printer as a sample, in 2006 I got my avatar from Second Life printed, as a solid piece. 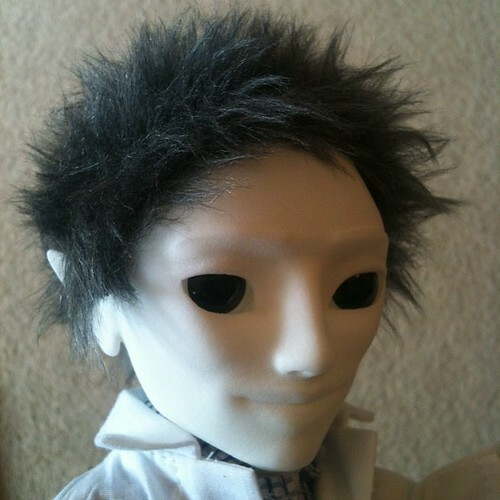 Now, in 2012 I have designed a face, picked eyes, hair and clots and have a 10″ fully articulated 3d printed figure. Printed close to home in the UK. He, as it is a he, has a hollow head ready for a lilypad arduino and a hollow body suitable for a battery. He is also number 31 out of 100 from the very first alpha run. So he is physical proof that the future is here, and he will be coming on tour and to conferences to prove that very point. It is quite an advance over the past 12 years, and hard to ignore the physical evidence or progress. He arrived in a very nice tube. 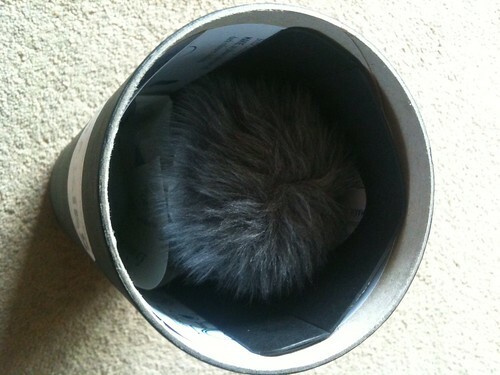 Everything neatly packed in that tube, look you can see his head…. lets loose that analogy! 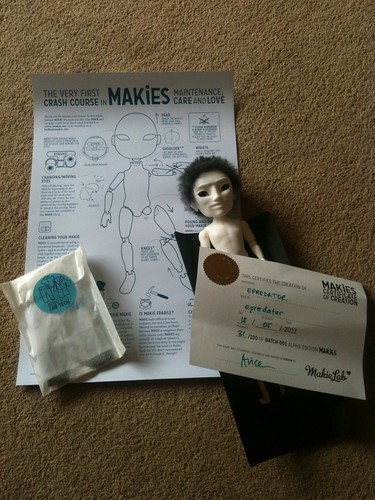 And here he is, modesty covered by the ownership certificate. I went a bit elven with the ears, and went for solid colour eyes and the grey wig (I would have gone for the usual green hair, but there is always dye 🙂 ) The eyes can hair can of course be swapped out as this is a modular design. Once dressed in his g33k science lab coat (one of the early clotehs designs that clearly appeals to the target market) he gave the Queen a quick wave. I wonder what I will be having printed and where in another 6 years time? Back in 1977 there was a Royal Silver Jubilee. I was 9 going on 10 and I do remember it as quite an event. Though 1977 was a good year for lots of other things too. Punk and Star Wars as an example. I remember all the flags being out, street parties and lots of pomp and circumstance. This weekend is likely just the same. 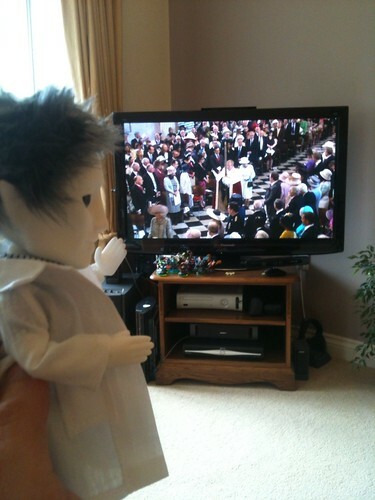 A 4 day weekend in the UK to celebrate the Diamond Jubilee of Queen Elizabeth II. The predlets school is having a red white and blue day, combined with some parades and a re-enactment of the coronation. We have some parties to go to and everywhere you look there are union flags. 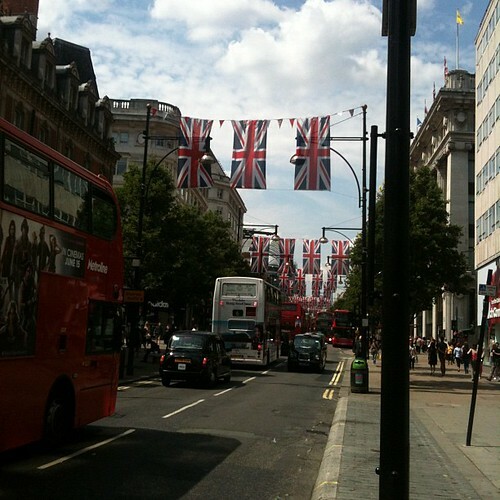 I popped to London on wednesday and it was obviously fully decked up. What was interesting though was that I don’t remember any good graffiti in 1977. 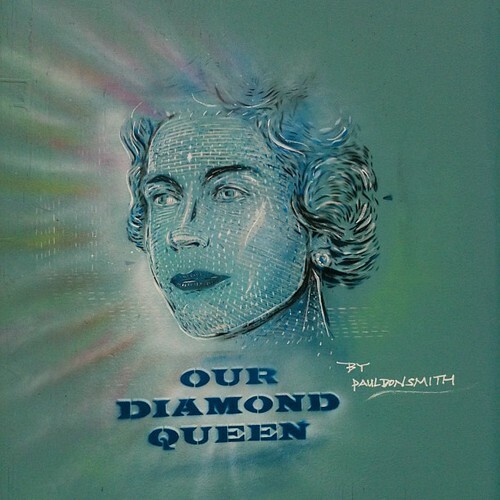 It was just tagging and general vandalism but London had some great graffiti celebrating the Queen’s reign. Which seems a little odd and mainstream, yet still is part of a counter culture. All this got me thinking to what it was like for tech and life in general when I was 9. It was even before the Atari VCS console. We had amusement arcades but we were just on the cusp of the video game age and the arrival of Space Invaders. The technology I was being influenced by, that shaped my future was Captain Scarlet, Joe 90 and Star Trek on the TV and in comics it was the start of the mighty 2000 AD – Judge Dredd, Harlem Heros and Flesh. These were all things lots of us liked, played out, talked about and things that connected us kids. They, like punk, separated us from the older generations who thought this was all stuff and nonsense. I can’t help thinking that all the tech and maker culture around kids today is naturally going to lead to an explosion of ideas and creativity that will leave many people behind just as these other popular culture revolutions did. In many ways the backlash against social media in some quarters is a “turn down that noisy racket” parental response. It is good there is that to rebel against, to rebel against spoon feeding of brands and products and allowing creativity to thrive around them. So we are way past 2000AD in 2012, but I think we have ended up with an even more exciting future, sure we are not all in space and flying cars around but the tech we have at our finger tips would have been just as amazing in 1977 to us 9 year old would be geeks and gamers as anything that we read or saw on TV.